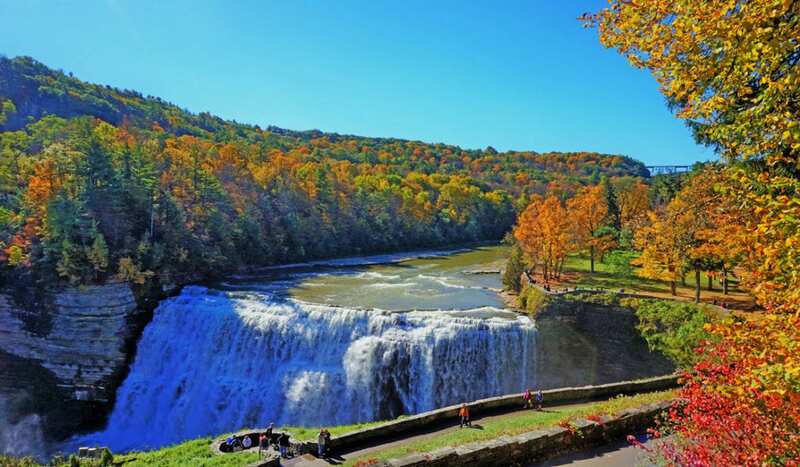 Letchworth State Park, also called Grand Canyon of the East, lures its visitors with spectacular scenery created by the Genesee River rushing through a deep gorge and passing over three magnificent waterfalls along the way. Its beauty is captivating any time of year, but especially in autumn when each overlook becomes a masterpiece on its own. Here you can unwind, connect with your family and friends, and see the leaves all dressed up for their last dance before arrival of winter. 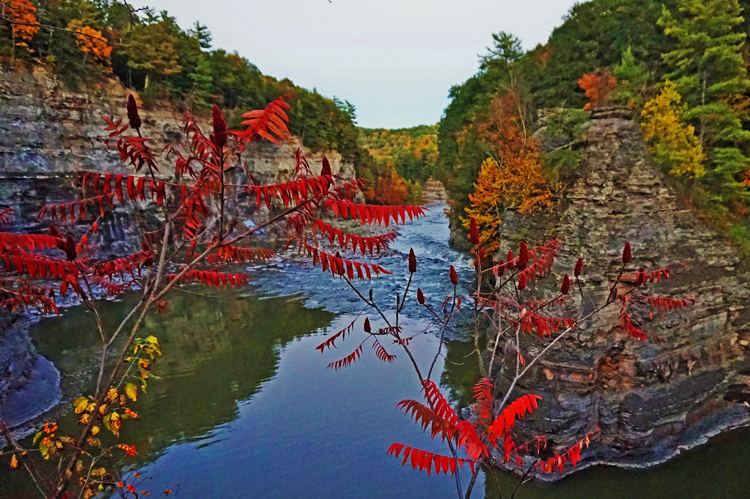 This year I had my mind set on visiting Letchworth State Park for its vibrant foliage season. I waited for a perfect day. With a great forecast for Columbus Day weekend, I decided on an overnight camping trip. Letchworth State Park is an easy access from interstate highways. 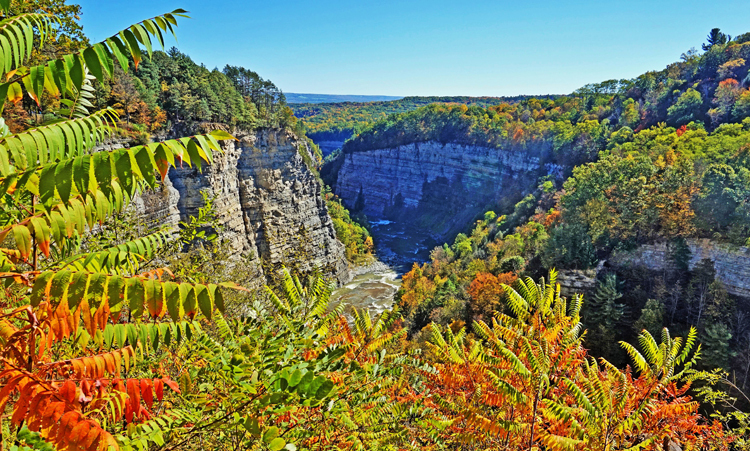 The park is located 35 miles southwest of Rochester, New York, and 60 miles southeast of Buffalo, in the far western portion of New York’s Finger Lakes region. It can be accessed via I-90 or I-86. I suggest skipping highways and taking secondary roads at least one way. On my way home to eastern Pennsylvania, I cut through the Finger Lakes Region. The views were spectacular! You will find the nearest airport in Rochester, New York. Make your reservation well in advance. 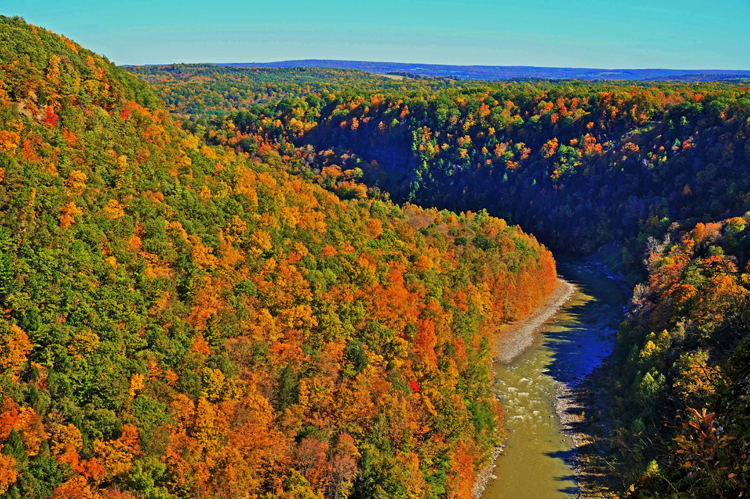 Letchworth Park is very popular. For its scenic beauty, outstanding recreational opportunities, and wide variety of lodging, the park was voted #1 in the 2015 USA TODAY Readers’ Choice Poll for the best state park in the US. 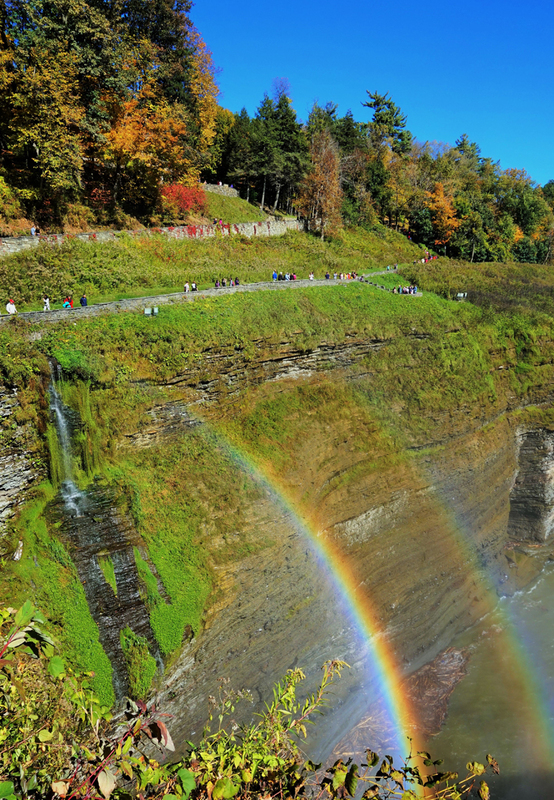 There are 270 campsites available at Letchworth State Park. With my first look at the reservation schedule, I realized that the park was almost solid booked during the entire month of October. There were only five sites left for my dates, each for only one night. I had to settle for a Sunday to Monday stay. Typically, a minimum stay is two nights. One day reservations are possible but cannot be made sooner than three days before arrival. I paid $40 for a spacious site with an electric hook-up. It felt rather high for one night camping so I used my Bank of America Better Balance Credit card’s quarterly bonus to erase $25 of this expense. There are 82 cabins located in different sections of the park. They are equipped with an electric stove and oven, refrigerator, beds, tables and chairs, picnic table, and grill. Some offer plumbing. Linens, pillows, cooking and eating utensils are not provided. Rates are between $40 and $130 a night. In-season, only weekly rentals are available. I did not stay in these cabins, but I drove around to see them. They look rustic but inviting. 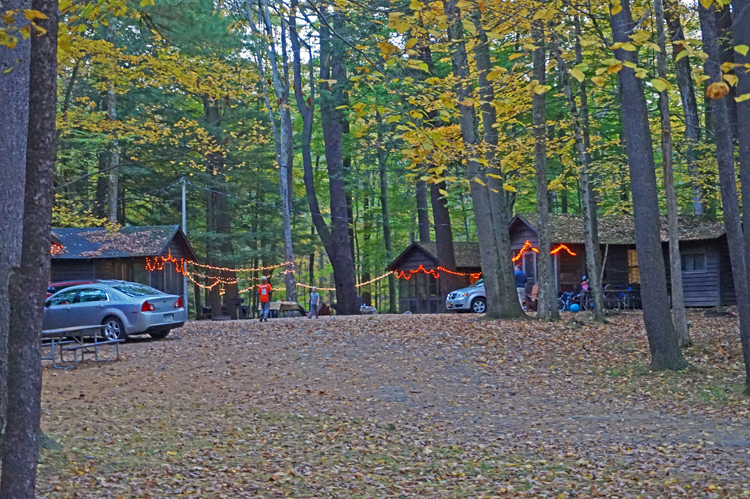 Majority of them were decorated by renters with orange lights which accentuated the atmosphere of the fall. Old fashion Glen Iris Inn offers modest two-person rooms and two-room suites for four. Rates are about $100 per room. There is a nice restaurant with an outdoor sitting. I had an evening meal there complemented by a glass of local Finger Lakes wine. From the inn you can take a stroll towards Middle Falls illuminated during the night. It is a sight to be seen! Major attractions of the park are three beautiful waterfalls called the Upper, Middle, and Lower Falls. They can be viewed from a hiking trail that follows the rim of the canyon for 7 miles. The canyon’s cliffs are very high and surrounded by lush forest that turns into a breathtakingly colorful carpet in autumn. Many of the viewpoints are accessible from parking lots and can be reached without extensive walking. Lower Falls Trail is the most intimate of the three. Here, the canyon is narrow and the walls are more diverse than sheer walls of the other sections. There is a charming bridge crossing over the river. The bridge trail is muddy and extremely slippery. Watch your step there. I advise to wear hiking boots. The weather was absolutely gorgeous when I visited in mid-October 2015. I will remember this trip as a feast to my senses. My eyes could not get enough of the colors around me. I was watching the leaves gently falling to the ground. I drove through the tunnels of yellow foliage on the park’s secondary roads. I saw birds gliding over the canyon. I heard them singing. The smell of the leaves was in the air. 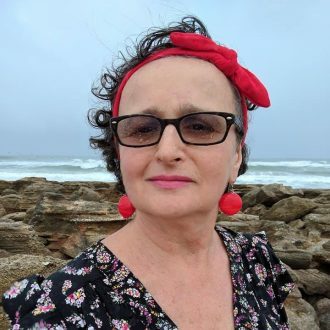 I was touched by the wind and sprinkled by drops of water coming from the falls. Even when driving, I had my radio off and the windows open to take it all in. There is no Internet and cellular service is almost non-existent, so you can really get away! Hiking and scenic-overlooking are the primary activities. Rafting, kayaking, horseback riding, mountain biking, hunting, and even hot air ballooning are available. There are many open fields in which to play. Simple playgrounds are scattered throughout the park. Nature, history, and performing arts programs are often offered. The park appeals to visitors of all ages. I saw a lot families, often three generations, enjoying each others’ company on the trails, at the campsites, or having a picnic. Group camping is very popular. There were many young families with children staying at the park together. It was nice to see kids playing and adults relaxing by the fire. If you plan on meeting someone in the park, do not relay on your phones. Service is very weak. Be specific where and when you want to meet. If time allows, try to combine this trip with another spectacular fall destination, such as a visit to Niagara Falls. See here how fall can be enjoyed even in the city. 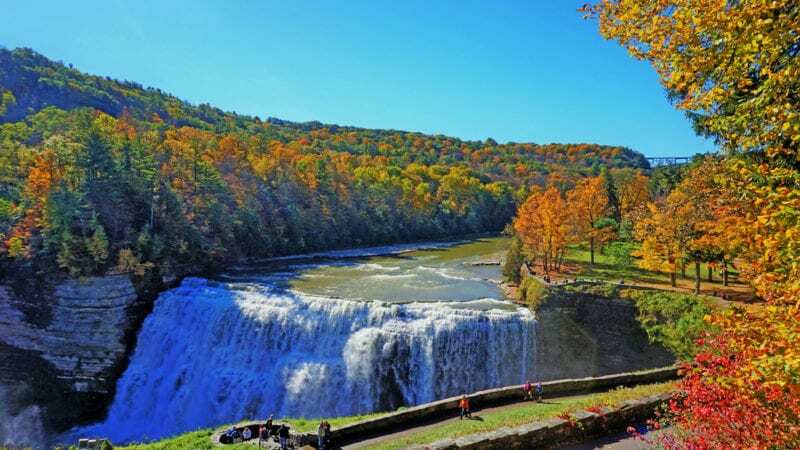 Have you visited Letchworth State Park? Share your experience with us in the comment section below. Just there yesterday ! Stunningly Beautiful radient fall colors and just a gorgeous day out. A must see if in the area! Agree! It is a beautiful place any time of year but during the fall is spectacular.